To kick 2018 off with a bang, the PokéCommunity Social Media Team would like to present its first event of the year, the PokéCommunity Trainer Tournament! Starting on January 10th, 2018 at 4:00 PM PST, both the official Facebook and Twitter pages of PokéCommunity (which by the way, if you haven’t followed them yet, you probably should) will release a series of polls to determine your favorite Pokémon Trainer of all time. We will be listing the details of the mechanics and the rules of the tournament itself below. There are 64 Pokémon Trainers, specifically all of the Gym Leaders and Trial Captains across the seven Pokémon regions, in this tournament. These trainers will battle it out in a series of match-ups in a tournament style bracket, and you have the power to decide who goes through the next round by voting for them via reacts on Facebook and polls on Twitter. At the start of the tournament, the 64 trainers are randomly sorted into 16 groups of four, where in each group, the 4 trainers are pitted against each other to get the highest number of votes, and have the honor to advance in the next stage of the tournament. After all 16 rounds of the Preliminary Stage are complete, the 16 winners of those rounds are then randomly sorted again into four groups of four. They will also battle each other out to get the highest number of votes, however two out of those four trainers will advance to the next stage, and compose of the first 8 trainers of the Top 10. 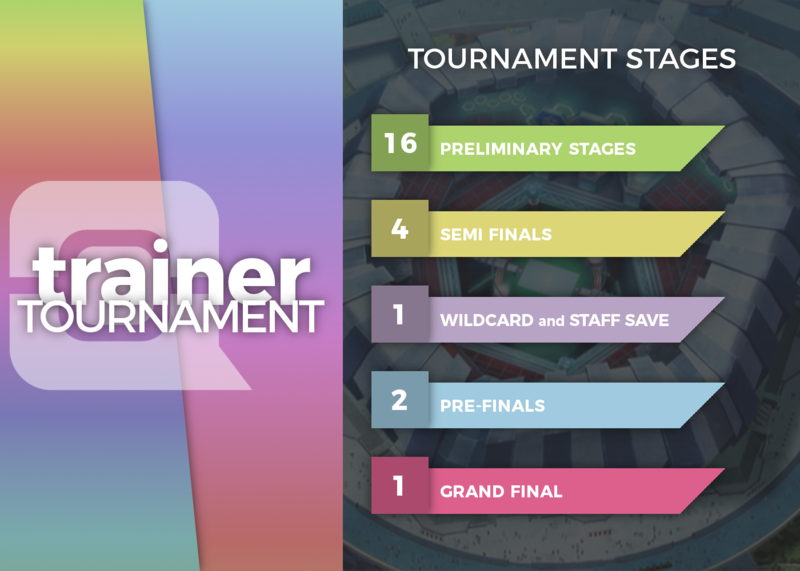 After the 4 Semi Finals, there will be a wildcard round, where in the 2nd place trainers from the Preliminary Stage, and the 3rd place trainers from the Semi Finals would be given a second chance and fight for the 9th spot on the Top 10 trainers. Unlike before, where Facebook reacts and Twitter polls are utilized, Facebook comments and Twitter replies are used to determine the trainer who gets the 9th slot. At the same time, the Social Media Team Staff are given the chance to handpick a trainer to be given the 10th and final slot and join the Top 10 trainers. On the next stage of the tournament, the Top 10 trainers will be divided into two groups of five. In each group, there are 4 trainers from the Semi Finals, and 1 trainer from either the Wildcard round or the Staff Save vote. Unlike before, where each round lasted a day, on this stage, the rounds will last 2 days. The top 3 trainers who get the most Facebook reacts and Twitter replies in each group moves forward and becomes the Final 6 trainers. At the grand final, the 6 trainers are pitted against each other in one last poll, and will last for a week. However, alongside the final poll where in the corresponding reacts and replies are counted, each trainer would be given their own corresponding Facebook post or tweet, and any Facebook reacts, or Twitter likes on their dedicated post would count towards their final score. 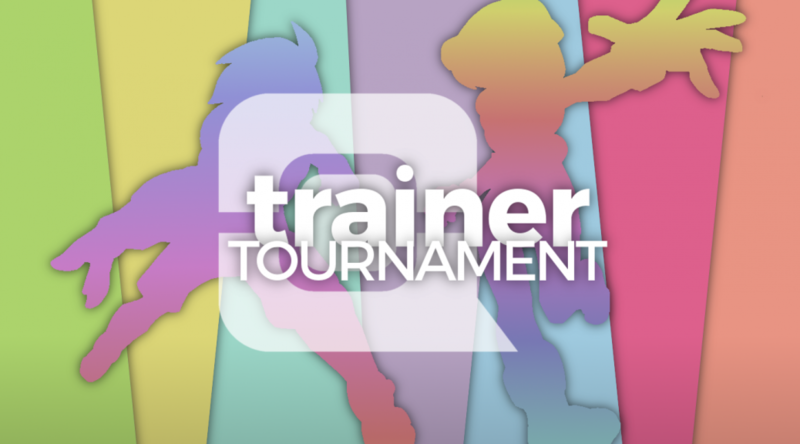 The trainer who gets the most number of Facebook reacts and Twitter replies from the final poll post, and the most number of Facebook reacts and Twitter likes on their dedicated post will win the Trainer Tournament. Now that you know how the tournament works, how does one vote for their favorite trainer then? All voting procedures will happen on the official Facebook and Twitter pages of PokéCommunity. Failure to follow any of these rules will result in a nullification of vote. If there are multiple votes where in there should only be one, only the first vote would be counted as long as it follows the rest of the rules. On all stages, the final tally from Facebook and Twitter are combined to form the final results of each poll. Preliminary Stage: You may vote for your favorite trainer by choosing the corresponding Facebook react associated with the trainer. Reacts on shares are also counted, so it is highly encouraged for you to share the post. The top trainer who gets the most reacts associated to them advances. Semi Finals: You may vote for your favorite trainer by choosing the corresponding Facebook react associated with the trainer. Reacts on shares are also counted, so it is highly encouraged for you to share the post. The top 2 trainers who gets the most reacts associated to them advances. Wildcard: You may vote for your favorite trainer by commenting on the post the NUMBER of the trainer shown on the post. You may vote up to three trainers per account, however there should only be ONE VOTE PER COMMENT. The top trainer who gets the most comments advances. Pre-Finals: You may vote for your favorite trainer by choosing the corresponding Facebook react associated with the trainer. Reacts on shares are also counted, so it is highly encouraged for you to share the post. The top 3 trainers who gets the most reacts associated to them advances. Grand Final: There are two major ways to vote. You may vote for your favorite trainer by choosing the corresponding Facebook react associated with the trainer on the Grand Final poll. Reacts on shares are also counted, so it is highly encouraged for you to share the post. You may also vote for your favorite trainer by reacting to their individual Facebook post that will be posted alongside the Grand Final poll. All reacts are counted as a vote. The votes from these two would then be combined at the end to determine the winner. Preliminary Stage: You may vote for your favorite trainer by choosing the poll option associated with the trainer. The top trainer who gets the most votes advances. Semi Finals: You may vote for your favorite trainer by choosing the poll option associated with the trainer. The top trainer who gets the most votes advances. Wildcard: You may vote for your favorite trainer by replying on the post the NUMBER of the trainer shown on the post. You may vote up to three trainers per account, however there should only be ONE VOTE PER REPLY. The top trainer who gets the most replies advances. Pre-Finals: You may vote for your favorite trainer by replying on the post the NUMBER of the trainer shown on the post. You may vote for ONLY ONE TRAINER PER ACCOUNT. The top 3 trainers who gets the most replies advances. You may vote for your favorite trainer by replying on the post the NUMBER of the trainer shown on the Grand Final poll. You may vote for ONLY ONE TRAINER PER ACCOUNT. You may also vote for your favorite trainer by liking their individual tweet that will be posted alongside the Grand Final poll. All reacts are counted as a vote. That is all there is to it with the PokéCommunity Trainer Tournament. If you have any further questions or clarifications, you may send us a message at our social media pages. Finally, here are the links to our social media pages. Edited by bobandbill, Jake and Zach. An adorkable Social Media Teamster for PokéCommunity's Facebook page. She loves Homestuck and Steven Universe so much, she will fight you if you mess with her interests. She's also 90% composed of salt generated from playing online Mafia with a bunch of salty underground snails.